Power Bi is a Business Intelligence tool to which we can upload data and delivers data throughout our Organization. Business Intelligence answers to any query with rapid answers and improves decision making. Adding value to the business for better visualization of data. It helps to identify significant areas, hidden patterns and make proper predictions. The objective is to take data from different sources applying some common business rules bringing into one common platform which simplifies the data report for an organization. It provides a Cloud-based platform for connecting to data sets and establishing the reports. It gives out pictorial representation of the work to the end users in an understandable manner which in turn creates personalized dashboards. Power BI has a service called Natural Query Processing. Power BI Desktop: Hundreds of data sources are collected in the desktop which generates report and visualizations. Online services: All the reports from desktop BI are published here. Power BI uses Software-as-Service (SaaS). Power BI Gateway: It works with On-premises information. It sends queries to the data source and returns the result to gateway cloud service. Power BI data gateway keeps the data fresh and updates with minimum effort. Mobile App: We can be connected anywhere with data. Power BI app works in the following Platform. Another feature of Power BI Is Quick Insights in which we can search a dataset for exciting patterns and provides a list of charts for a better understanding of data. It may use artificial intelligence to analyze the data. The workspace has four tabs: Dashboards, Reports, Workbook, Datasets. We can display dashboards and reports on a mobile device using native apps. To use data refresh we need to take data from data sources and push it into the SAAS model. For example, if data is moved from the SQL server into Excel. Excel file is uploaded in one drive where Power BI reads it. After reviewing, Power BI generates a SQL Server Analysis that generates dashboards, reports. We need a Power BI Account. Public emails are not allowed. Work email addresses with domain .org and. Edu is supported. Now, if you are looking for a job which is related to the Power BI then you need to prepare for the 2019 Power BI Interview Questions. It is true that every interview is different as per the different job profiles. Here, we have prepared the important Power BI Interview Questions and Answers which will help you get success in your interview. This first part covers basic Power BI Interview Questions and Answers. Q1. Why we need BI? We can take data and create the reports at the click of a button. Helps in attracting new customers to servicing and monitoring existing customers. We can keep Track of information and set our goals accordingly. In general, completely building an ETL solution. (Extraction, Transformation, Loading) ultimately helping management to make better decisions. The efficiency of an Investment (ROI) is very high here. Making unwanted data into progressive information. Q2. How to import the data in Power BI desktop? This is the basic Power BI Interview Questions asked in an interview. Go to getting data Sources (where we find data sources from a different domain) and select the sources (Excel, CSV, SQL) then Load it. To see the data, click Data view. To choose the table click on the fields and you can pick a visualization to generate a report. Q3. Give the difference between POWER BI vs TABLEAU? Data handling It drags down slow when handling huge data. Handles bulk data. User Interface Simple and easy to use. Use a customized dashboard. Cost Less expensive Very expensive since it uses data warehousing. Machine Learning It is associated with Microsoft Azure. It has python Machine learning. Let us move to the next Power BI Interview Questions. Q4. What are the Building blocks in Power BI? Q5. What is power Pivot and what are the filter writes in Power BI? Power Pivot is an in-memory component that enables highly compressed data storage. It is used to build a data model, relationship, creating formulas, calculated columns from various resources. 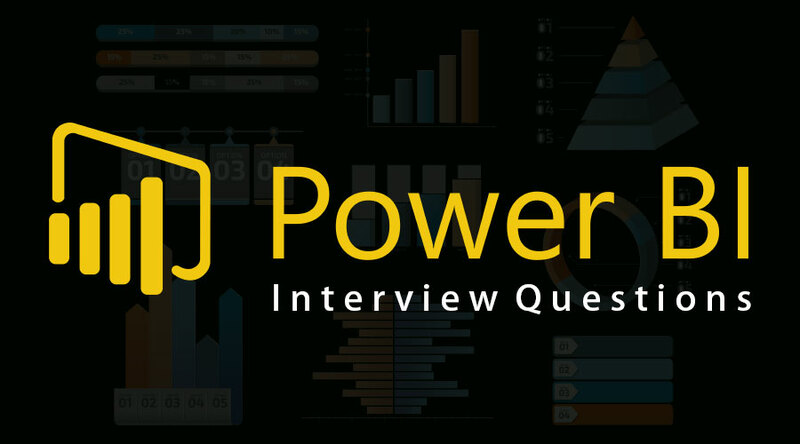 Let us now have a look at the advanced Power BI Interview Questions. Q6. Give the difference between Power BI Gateway and Data Management Gateway? Power BI Gateway – It is a software that works on-premise Network (the data that are not stored in the cloud). It can be used for a single data or multiple data sources (SQL Server, SQL SERVER ANALYSIS SERVICES, other data sources, files, share point). The data are stored encrypted in the gateway-cloud service. Data Management Gateway – This component gets continuous data, expose tables and views. Q7. What is the need of the new selection pane in the report Power BI desktop? It is used to control the tab order between visuals on a page. We can combine two or more visual page into one visual group. It is used to select data in a visual for highlighting and drill down. Q8. What data sets can be used to create a dashboard with streaming data tiles? 1.Streaming datasets (we need to have data which is cached in a memory before we use streaming data sets). Q9. What are DAX and the criteria to write DAX Expressions that references Calculated columns and measures? This is the advanced Power BI Interview Questions asked in an interview. DAX is the language used by Power BI, abbreviated as Data Analysis Expressions. It is a functional Language, the execution flows with function calls. They are structured to work with tables. Row context – It applies to measures. Filter context – Applying filters to calculations. When referencing a Calculated column, we must include a table name and DAX code automatically has row context for the table in which calculated column is defined. When referencing a measure, we can optionally include a table name. Q10. How Dynamic filtering in Power BI is performed? Once all the data are set up publish detail report to Power BI. Publish it to Group Work Space.